The power of short covering was on full display in the Indian Markets on Thursday. Very much on expected lines, the benchmark index NIFTY50 saw a gap up opening. Even better was that this was sustained and the Markets grew even stronger before they ended. The NIFTY ended the day with a robust gain of 196.75 points or 1.94%. Given the kind of shorts that were seen being created and still existing in the system, there are high chances that such up move primarily fed by short covering is likely to continue. Post RBI Credit Policy, the bank stocks saw tremendous momentum after the dovish stance that the RBI took while keeping the key rates unchanged. We can expect a positive opening once again on Friday and we expect the follow-up up move to persist at least in the initial trade. Friday’s session will see the levels of 10365 and 10400 playing out as immediate resistance area while supports are expected to come in at 10275 and 10210 zones. 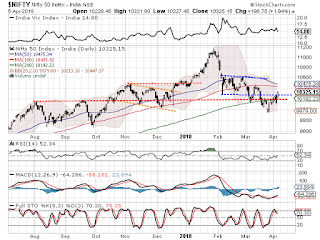 The Relative Strength Index – RSI on the Daily Chart is 52.3407 and has reached its highest value in last 14-days which is bullish. RSI also shows a bullish divergence as RSI marked a fresh 14-period high while NIFTY did not. RSI is also seen breaking out of a formation and is seen inching higher. Daily MACD stays bullish trading above its signal line. If we look at pattern analysis, the session remained technically significant. 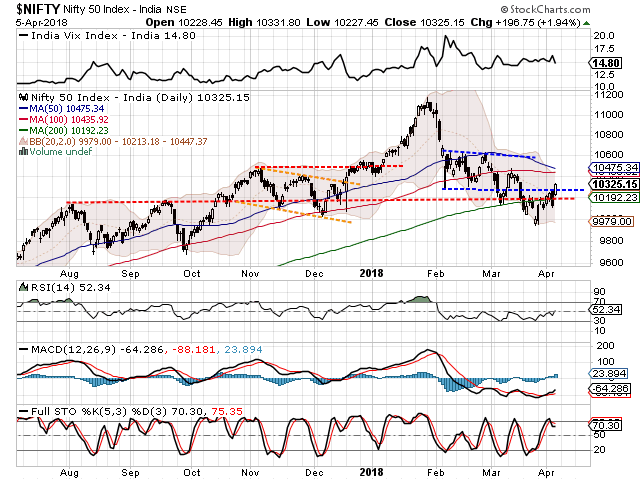 The NIFTY not only moved past and ended above 200-DMA which stand at 10192, the NIFTY has also moved past the 10180 mark which also happen to be an important support resistance. Now, in event of any consolidation happening, we expect this level of 10180 to provide pattern support to the Markets. Overall, though with intermittent consolidations, we expect the up move to extend itself. Some evident improvement in relative ratio and momentum is seen and this will see sector specific out performances continuing. Despite Thursday’s up move there are still large number of shorts that are seen existing in the system and this is likely to fuel the follow through up moves. Any consolidation or minor intermittent corrective moves should be continued to be used for making quality purchases.